Google Android and Chrome chief Sundar Pinchai spoke on stage today at a press event about online videos, saying that 200 billion online videos are being watched globally. But one problem people have apparently is how to bring the Internet to the TV — he says 15 percent of households each week are able to transfer that information over to the bigger screen. With the updated version of Chrome, Google hopes to extend the experience to the television. With Chrome, Google says that its approach to online entertainment is all about simplicity. It highlights three key points: that it should be fast and easy to set up, shouldn’t have anything new to learn, and work across platforms and devices. Chromecast is a 2-inch device (specifically 72(L) x 35(W) x 12(H) mm) built on Chrome technology running a simplified version of the OS. Consumers need only plug it into HDMI input, connect to the WiFi and sit back and watch. Google says that Chromecast will receive input from an app to display high-resolution content from the cloud to the device. Users have full control over playback from their mobile phone, tablet, or laptop. The device is intelligent enough to handle multitasking so that users can search for content without interrupting their on-screen viewing. Content can be queued up without stopping what people are watching. But what about those households that aren’t dedicated Android owners? Google says that for those with iOS devices, you can access the YouTube app, tap on the Cast icon and it will automatically push the content to your Chromecast-enabled television. 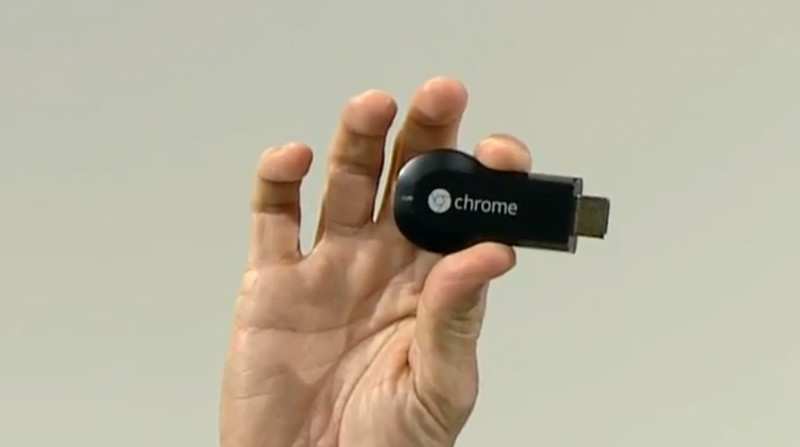 Chromecast works not only with YouTube, but also Netflix, Google Music, Pandora, and more. With this device, it competes against the likes of Apple TV, Roku, and other set-top boxes. In essence, Google is hoping Chromecast will create the true universal remote, except it won’t help you turn on/off your television. Developers who want to integrate their apps into Chromecast can utilize Google’s Cast SDK. If you’re looking to purchase the Chromecast, it’s available on the Google Play store for $35. It comes with three months of Netflix viewing for free. The device is also available at retail stores like Best Buy.